On Thursday, May 19, 2016, HHS is proud to host the annual Art Saves Lives exhibition! 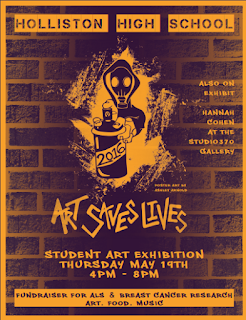 Art Saves Lives is a wonderful celebration and showcase of student work, which will be displayed from all of Holliston High's art classes and art classes from across the district's schools. Portions of the proceeds from this event will go towards Breast Cancer Research and ALS Research. Please join us on Thursday, May 19 from 4PM-8PM at the High School!